Pengguo Wang was educated in China and the UK. He received his PhD in Finance in Strathclyde University Business School. Prior to joining the University of Exeter Business School, he was a faculty member at Imperial College London and Bristol University. He worked as an ESRC Research Fellow in a joint program in Lancaster Management School and Manchester Business School. 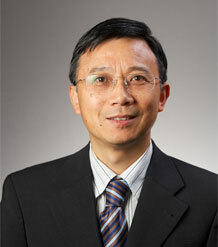 Pengguo’s research, teaching and consulting interests are at the interface of finance and accounting. His current research interests are focused on cost of capital, equity risk premium, market anomalies and fundamental valuation models, with particular reference to the links between financial statement information, risk and equity returns. His research has financially sponsored by ESRC, KPMG, ACCA, and The Institute for Quantitative Investment Research (INQUIRE-UK) grants. £285k, ESRC, Cost of Capital and Asset Pricing in the UK (with A. Gregory, C. Dargenidou, R.Tharyan). Wang P (In Press). Future Realized Return, Firm-Specific Risk and the Implied Expected Return. Abacus Full text. Wang P, Ashton D (2015). Conservatism in residual income models: theory and supporting evidence. Accounting and Business Research, Volume 45(Issue 3), 387-410.
persistence of abnormal earnings on the weights attached to book values, earnings and dividends. valuation and linear information dynamics. Wang P, Huang W (2015). The implied growth rates and country risk premium: evidence from Chinese stock markets. Review of Quantitative Finance and Accounting, 45(3), 641-663. © 2014, Springer Science+Business Media New York. Realized stock market returns are volatile and poor reflections of economic growth and investor expectations in China. In this paper, we estimate simultaneously the implied long run growth rate and cost of equity capital for listed Chinese firms over the period 2004–2012. We find that the implied mean growth rate in earnings is around 10 % and the mean implied cost of capital is about 14.6 %. These suggest that the implied growth rates from companies’ fundamentals are in line with the economic growth and the implied cost of capital is consistent with investors’ expectations. Comparing with estimates for the US markets, we find that the mean country equity risk premium for this largest emerging market is about 6.5 %. Our study has important implications to the Chinese policy makers and international investors. Wang P (2014). On the relevance of earnings components in valuation and forecasting. Review of Quantitative Finance and Accounting, 42(3), 399-413. This paper articulates the links between relevance of an earnings component in forecasting (abnormal) earnings and its relevance in valuation in a nonlinear framework. The analysis shows that forecasting relevance does not imply valuation relevance even though valuation irrelevance is implied by forecasting irrelevance. Firstly, I consider an accounting information system where earnings components "add up" to a fully informative earnings number. Secondly, I analyze two accounting systems where a "core" earnings component is the relevant earnings construct for valuation and the second earnings component is irrelevant but may be predictable and relevant in forecasting other accounting items. I find that dividend displacement effect on earnings and the dynamics of individual earnings components are critical in this analysis. © 2013 Springer Science+Business Media New York. Ashton D, Wang P (2013). Terminal valuations, growth rates and the implied cost of capital. Review of Accounting Studies, 18(1), 261-290. We develop a model based on the notion that prices lead earnings, allowing for a simultaneous estimation of the implied growth rate and the cost of equity capital for US industrial sectors. The major difference between our approach and that in prior literature is that ours avoids the necessity to make assumptions about terminal values and consequently about future growth rates. In fact, growth rates are an endogenous variable, which is estimated simultaneously with the implied cost of equity capital. Since we require only 1-year-ahead forecasts of earnings and no assumptions about dividend payouts, our methodology allows us to estimate ex ante aggregate growth and risk premia over a larger sample of firms than has previously been possible. Our estimate of the risk premium being between 3. 1 and 3. 9 % is at the lower end of recent estimates, reflecting the inclusion of these short-lived companies. Our estimate of the long run growth is from 4. 2 to 4. 7 %. © 2012 the Author(s). Wang P (2013). The role of disaggregation of earnings in stock valuation and earnings forecasting. Accounting and Business Research, 43(5), 530-557. This paper compares and contrasts two accounting information systems, the aggregate earnings system and the disaggregated cash flow/accrual system, examining their relative performance in stock valuation and in forecasting of earnings. It finds, in general, that the forecasts of earnings and predicted market values from the cash flow and accrual system have smaller forecasting errors than those from the aggregate earnings system. The adjusted R-squareds from the disaggregated system are in the main higher than those from the aggregated system when considering the explanatory power of the model-predicted values. The results also show that the cash flow and accrual system forecasts dominate the aggregate earnings system forecasts in a large majority of industries. © 2013 Taylor & Francis. Ashton D, Wang P (2013). Valuation Weights, Linear Dynamics and Accounting Conservatism: an Empirical Analysis. Journal of Business Finance and Accounting, 40(1-2), 1-25. Residual income models provide an important theoretical link between equity valuation and financial statement variables. While various researchers have developed models of how accounting policy impacts on the structure of these models, empirical support for these models is at best weak and frequently contradictory. In this paper, we develop an analytical model, which identifies the dependency between valuation weights in residual income models and the associated structure of earnings information dynamics and accounting conservatism. In contrast to many earlier studies, we find strong evidence of conservatism in our reformulation of the linear dynamics. We proceed to test our predictions of the dependency of the weights on two measures of conservatism, the conventional measure of price-to-book ratio and the recent measure of a C-Score index developed by Khan and Watts (2009) and find that the empirical results accord well with our theoretical predictions in the case of the former but not the latter measure. © 2013 Blackwell Publishing Ltd.
Wang P, Ashton D, Peasnell K (2011). Residual Income Valuation Models and Inflation. European Accounting Review, 20(3), 459-483. Full text. DOI. Pope PF, Wang P (2005). Earnings Components, Accounting Bias and Equity Valuation. Review of Accounting Studies, 10(4), 387-407. DOI. Cooke TE, Ashton D, Tippett MJ, Wang P (2004). Linear information dynamics, aggregation, dividends and 'dirty surplus' accounting. Accounting and Business Research, 34(4), 277-297. Wang P (2003). Choosing a valuation operator for pricing assets with long–short spreads: the impact of transaction costs and taxes. The British Accounting Review, 35(3), 199-214. DOI. Pope P, Wang P (2003). Discussion of Positive (Zero) NPV Projects and the Behavior of Residual Earnings. Journal of Business Finance Accounting, 30(1-2), 17-24. DOI. Walker M, Wang P (2003). Towards an understanding of profitability analysis within the residual income valuation framework. Accounting and Business Research, 33(3), 235-246. DOI.